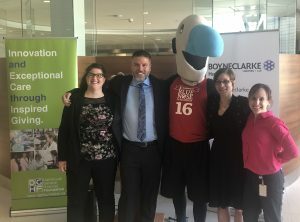 HALIFAX, Nova Scotia, March 27, 2019 – BOYNECLARKE LLP has announced their participation in the Scotiabank Charity Challenge in conjunction with the Scotiabank Blue Nose Marathon, directing all their fundraising efforts to the Dartmouth General Hospital Foundation. The Dartmouth General Hospital Foundation raises funds from within the community to support the Dartmouth General Hospital. Their current focus is on their Above & Beyond Capital Campaign, with a goal of raising $13 million dollars that will go towards a new Surgical Centre, Intensive & Intermediate Care Units, Ambulatory Care & Endoscopy Centre, among other campaign priorities for the hospital. Each year, BOYNECLARKE LLP chooses to focus on a different charity for the Scotiabank Charity Challenge. The Dartmouth General Hospital Foundation was the perfect fit, with both organizations being rooted in Dartmouth and having a distinct focus on the community and giving back. Since founded in 1972, BOYNECLARKE LLP has grown to become one of Atlantic Canada’s largest full-service law firms, with a blend of personal, business, and institutional lawyers. The Foundation raises funds from the community to help support the needs of the Dartmouth General Hospital (DGH). These funds support capital construction, the purchase of priority medical equipment, professional development opportunities and new technology for DGH.